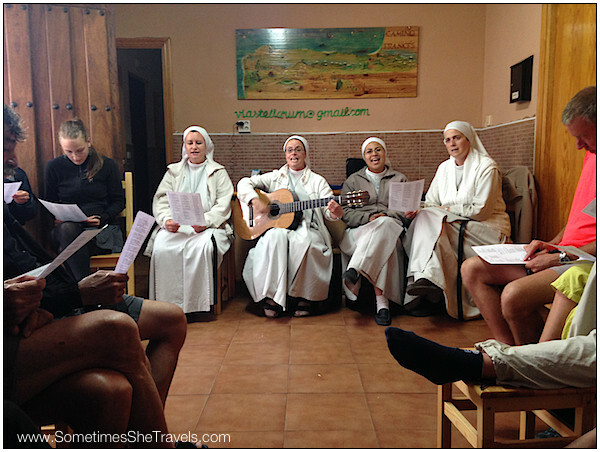 …to a spiritual song sing-along with the nuns at Albergue Paroquial Santa Maria. 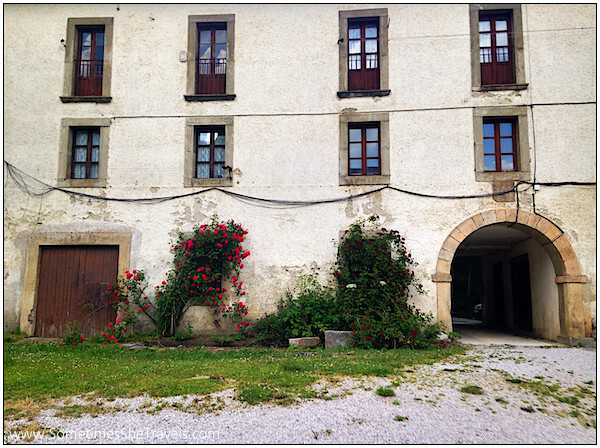 The pilgrim hostels, or albergues, along the Camino Francés, were varied and provided all manner of experiences, most welcome, others less so. Yet despite the myriad frustrations that often accompanied the communal living, the rewards far outweighed the drawbacks. 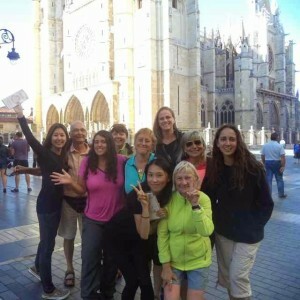 International group of pilgrims at León. 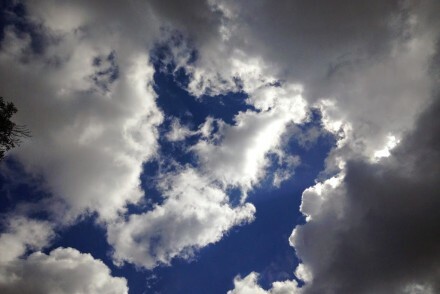 Photo courtesy of Yeni B. The sense of camaraderie (see my post about the interesting origins of this word) was palpable in most places, although to be sure, everyone did not always get along and there were times when certain people avoided certain others (what happens on the Camino stays on the Camino)… But overall there was a sense of common purpose and a shared journey. To ensure dry clothes by morning, laundry was typically the first thing we did upon arriving at our destination (well, after a shower), in order to take advantage of the warm, often hot, afternoon sun. Space on clotheslines was often at a premium and on my next Camino I will be sure to carry at least ten clothespins with me. Pilgrims spend a fair amount of time discussing laundry soap; some carried special laundry bars, others carried little containers of detergent. For many of us, shampoo did double duty as laundry soap. 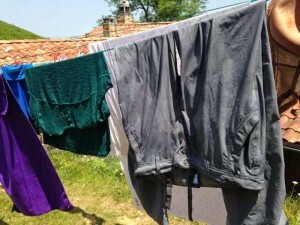 Quick-drying clothing from Ex Officio or SmartWool or one of many other companies almost guaranteed dry clothes by the morning. 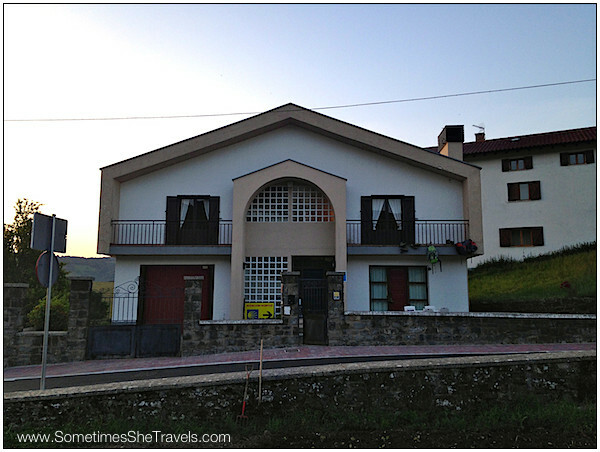 The night before starting my Camino, I stayed at Corazon Puro in Bizkaretta, located between Pamplona and St. Jean Pied de Port. 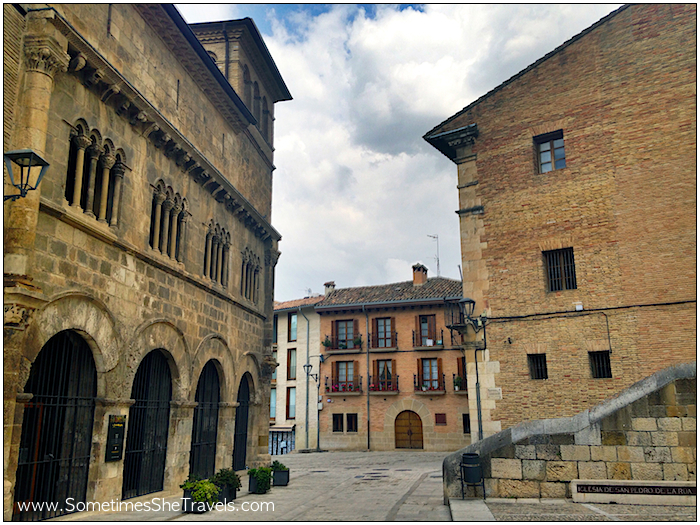 They offer a wonderful service to pilgrims; for around 45E, they pick you up in Pamplona, drive you to their albergue where you are served dinner and have a bed in a small room. The next morning, after you are served breakfast, they drive you to the ____ gate in St. Jean Pied de Port to start your Camino. My bedroom at Corazon Puro where I ended up with a private room because they weren’t full. Little did I know at the time how luxurious it was to have a room to myself. with people developed right here the first night. Day 1. 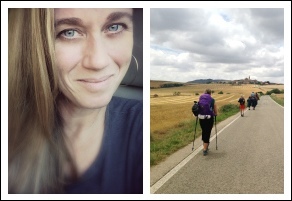 Olalla and I continued traveling together for many days after that, until she experienced knee problems in Najera and had to take some rest days to heal. I still communicate regularly with Felix and Olalla from Orisson. 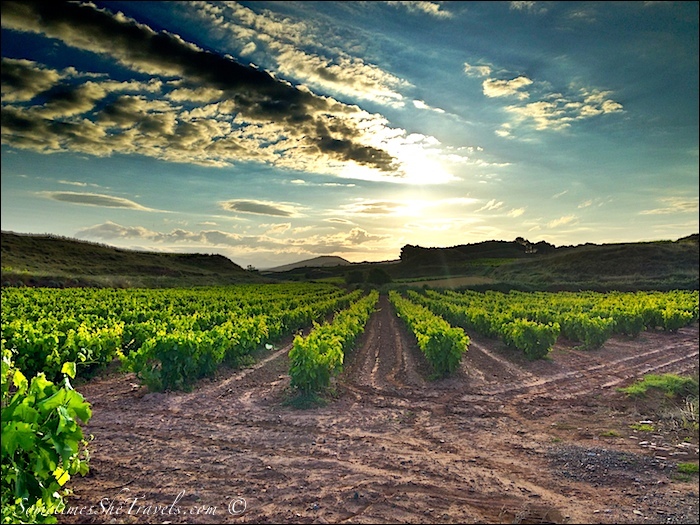 I can’t recommend Orisson highly enough for those starting from SJPdP; I will definitely try to make reservations there again on my next Camino Francés. Day 1: Two pilgrims relaxing at Orisson. Day 2: Yan(? 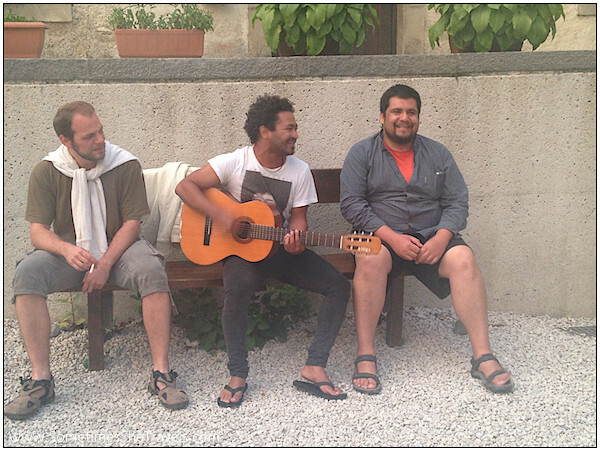 ), Al, and Benjamin providing the pilgrims with music in the courtyard at Roncesvalles. 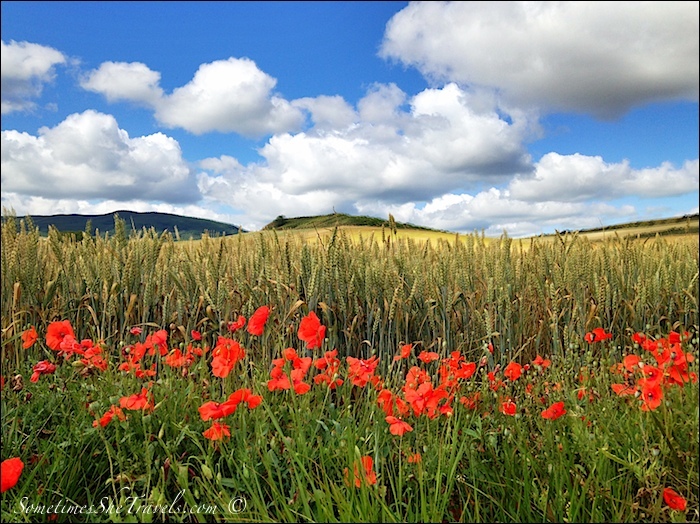 Day 2/Roncesvalles: Some of the most beautiful beds on the Camino in my opinion. 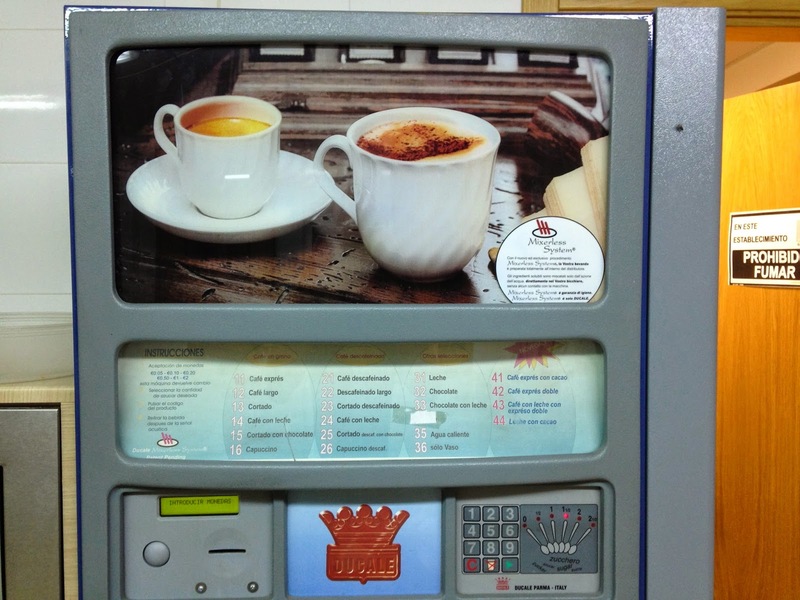 Eating a vending machine breakfast in the dining hall at Roncesvalles before setting out for Zubiri. Thank goodness for “second breakfast”, which always came an hour or two after being on the Way. 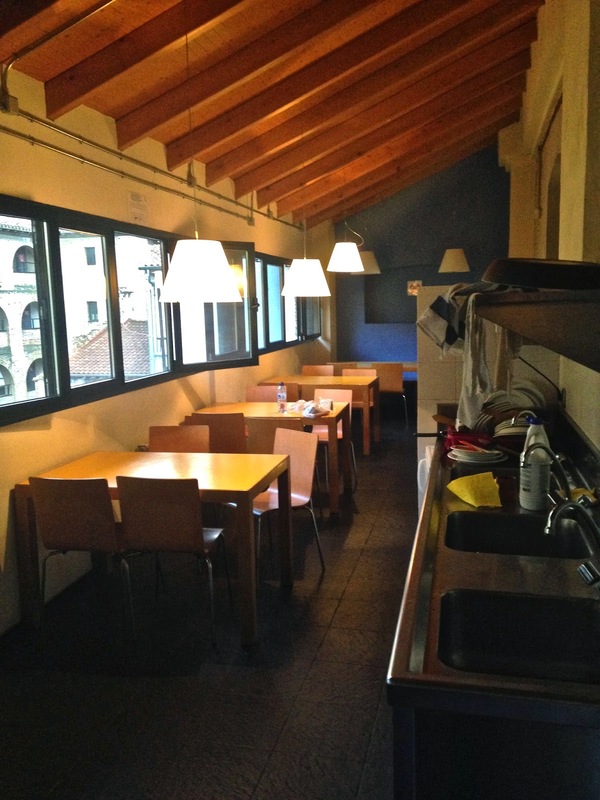 Day 4: The kitchen at the municipal albergue in Pamplona. typically several Euros less expensive than private albergues. 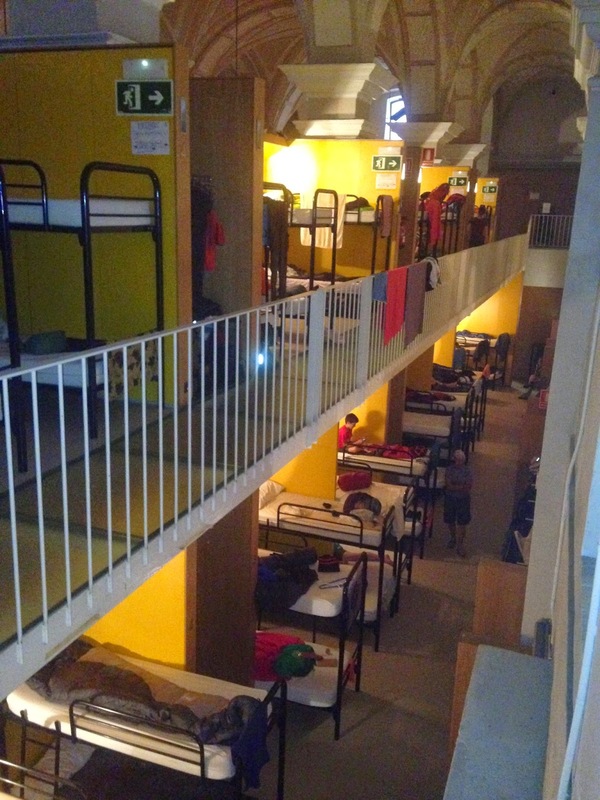 Day 4: The dorms in the Albergue Municipal in Pamplona. Amenities: light in each quad & an outlet for each bed. Drawbacks; giant bright night lights and many, many people. Day 6: I insisted we walk to Ayegui rather than staying in Estella so that we would be farther up the mountain for our walk on day 7. Unfortunately, it was in a modern part of town and we slept in the basement of what is an athletic facility. Additionally, we basically had to backtrack over the distance we had covered to go get food. However, that night we met Teodora and Con as well as some other nice people and I got to spend some quality time talking with Ana Caminante. 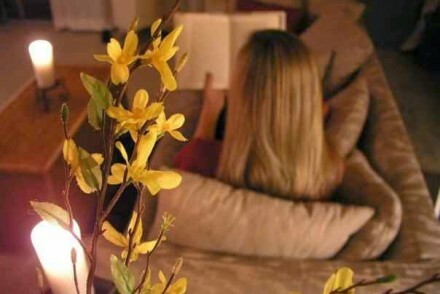 earthquake when the person above or below moves during the night. Day 6: My space for the night in Ayegui. That’s my clotheslines stretched from post to post. Day 7: Mexican sisters Ana and Yeni relaxing by the lockers at Pata de la Oca. I don’t remember whether any of actually used the lockers. Day 7: Waiting for dinner in the restaurant at Albergue Pata de la Oca in Torres del Rio. Day 8: Pavel and Olalla relaxing in their bunks at Albergue _________ in Logroño. 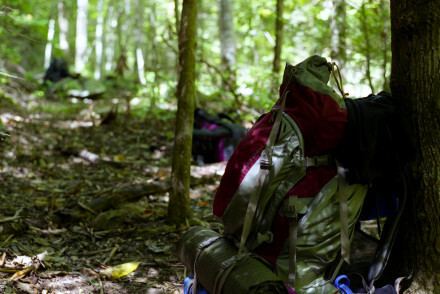 Remember, they started hiking at three in the morning and ran into a few bumps along the way (major blisters, losing the flashlight, losing their way….) But they loved the adventure. Day 8: Albergue Puerta de Nájera. Charming place albeit somewhat crowded with beds. I don’t think there was a night that I didn’t have a bottom bunk. Day 8: Albergue Puerta de Nájera. Day 8: Albergue Puerta de Nájera. 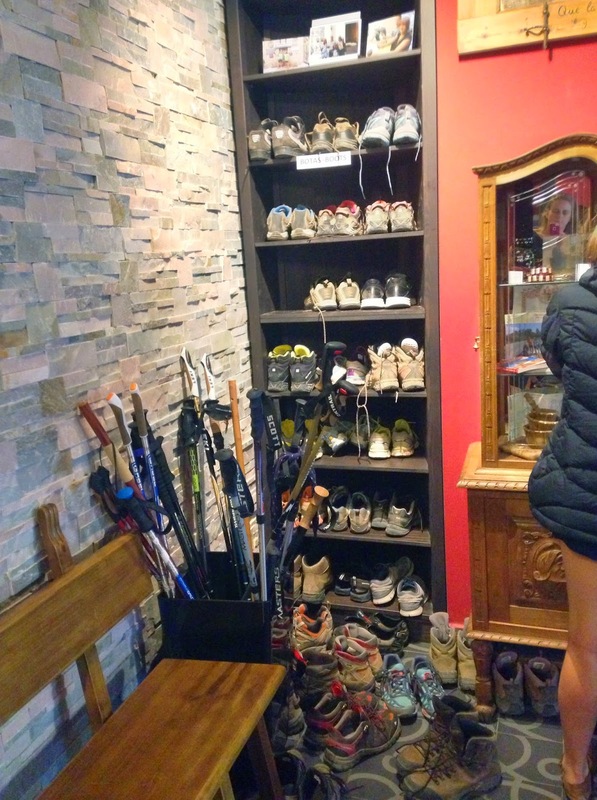 Most of the albergues required that pilgrims remove their boots before entering the dormitories. Day 9: Santo Domingo de la Calzada (albergue municipale). #*[email protected]#M([email protected] night light. Day 9: Santo Domingo de la Calzada (albergue municipale). 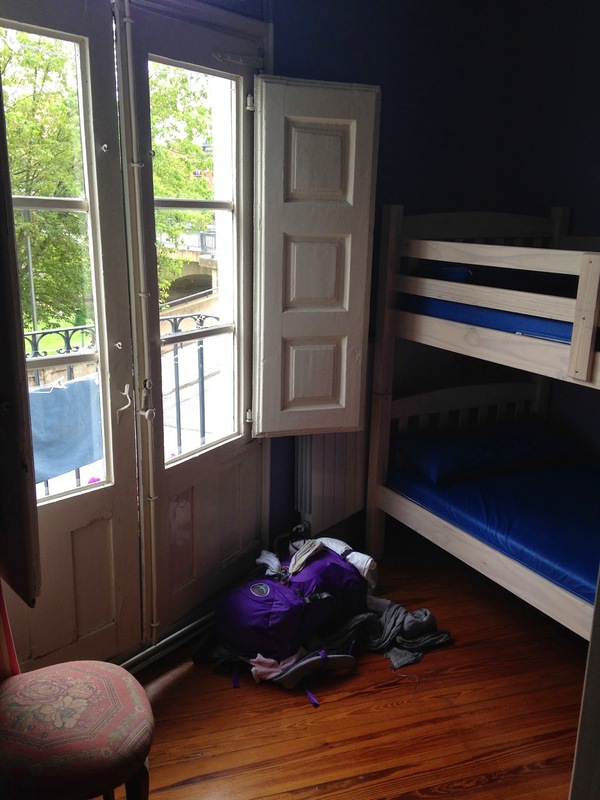 Day 10: Belorado, Burgos (Albergue Cuatro Cantones). Poor exhausted pilgrim crashed out at the kitchen table. 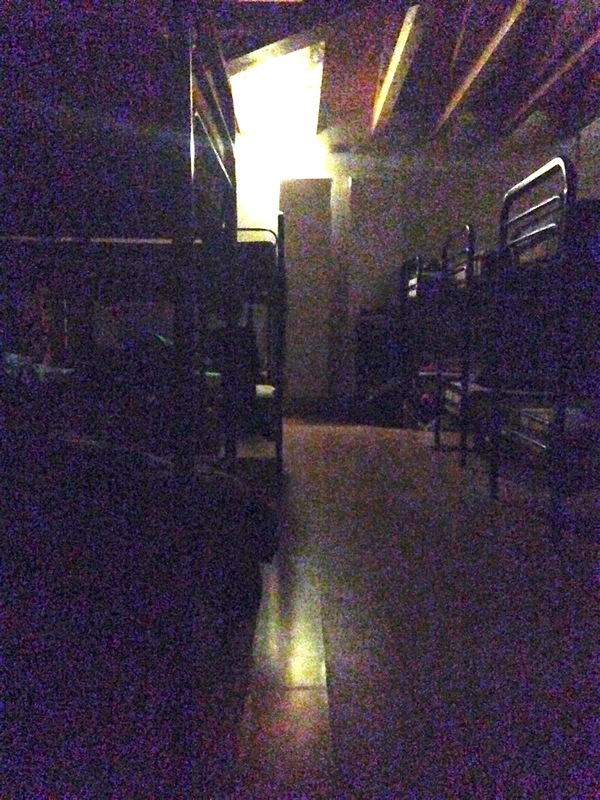 Belorado, Burgos (Albergue Cuatro Cantones). More crashed out pilgrims mid-afternoon. This is actually a really sweet couple I ran into over and over. 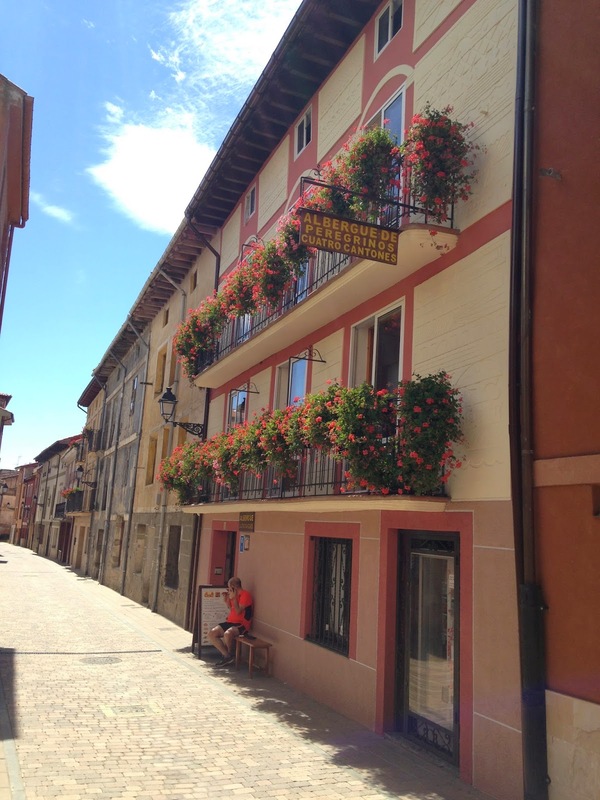 Day 11: Belorado, Burgos (Albergue Cuatro Cantones). Charming! Albergue Hutte in Atapuerca. I don’t know what “Hutte” means but “hut” would be appropriate. This was my least favorite of all the albergues in which I stayed. I got the impression that once it had been a barn. It was very dark (despite appearances). Additionally, all my friends stayed at the other albergue in town. How did this come about? When I arrived in Atapuerca and went to the other albergue, a person I didn’t feel comfortable with was already there. Rather than risk being stuck there with him alone (I didn’t know if my friends were going to end up in Atapuerca that night or not), I decided to go to the Hutte. The good news was that I met a very nice Spanish couple and their 12 year old daughter (see the picture below) and ended up walking with them frequently over the next few days. I have the lower bunk again and was happy to get a bed near the only window. Sweet Spanish couple who were walking with their pre-teen daughter. Here you can see that the beds were often pushed right next to each other so you were basically sleeping in a double bed with a stranger! 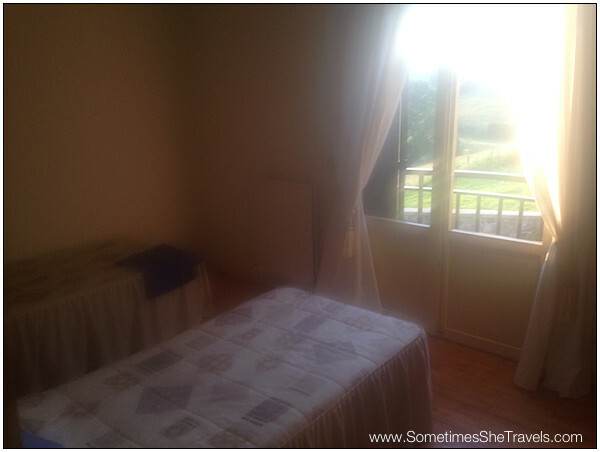 Yeni and I stayed at the Albergue Municipal in Hontanas. Our friend Keong whom we had known since day 1 was also here with a group of south Koreans and our new friend, Bernardo Clemente, whom we had met in Belorado also stayed here. The architecture was phenomenal. It was a renovated old stone building that combined new and old. Pilgrim clothing drying in an ancient stone courtyard in Hontanas. Once again, I scored the bottom bunk. 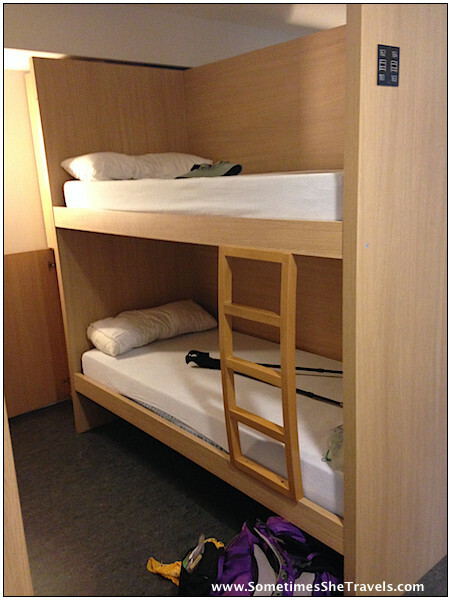 My friend, Kyeong, whom I’d met my first evening on the Camino at Orisson, was in the top bunk. And there were hooks in the shower!!!!! Who knew that shower hooks could make me so happy? (My dry sack with clean clothes hangs on one and my scarf/sarong on the other). 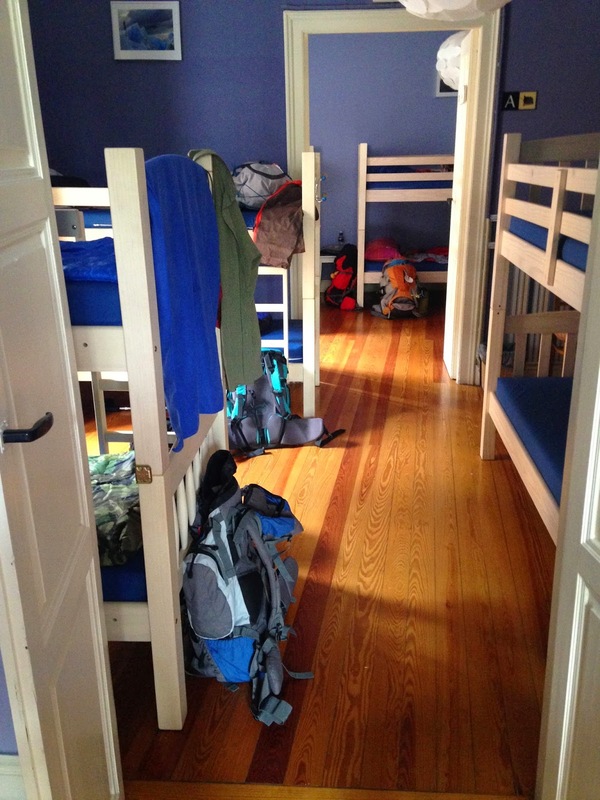 I loved the loft although climbing up and down the ladder in the middle of the night was a bit of a hassle and it was a wonderful change not having anyone above or below me in a bunk bed. Albergue Paroquial Santa Maria in Carrion de Los Condes. Wow, what a change from the last albergue. Not only was it packed, here we ran into a huge group of college students from Pepperdine. They were very nice but it was strange to be around a large from of Americans after spending all my time with Europeans the past couple of weeks. That’s Armanda across the room. And below her is Fie, a lovely young woman from Denmark who speaks English so well that I assumed she was from the United States. 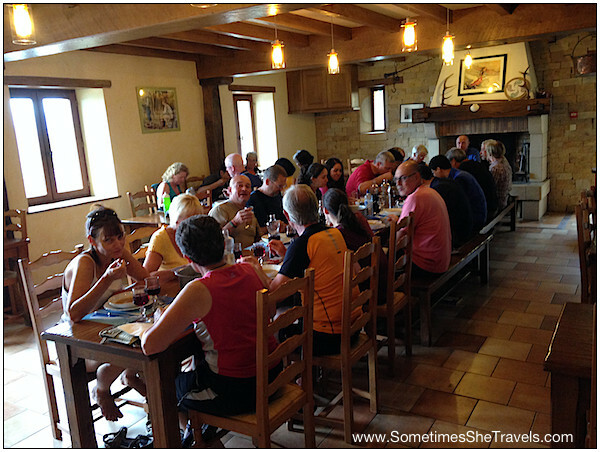 We met here in Carrion and continued to see one another throughout the rest of the Camino. Here’s my bunk (yep, the lower one) in Carrion. 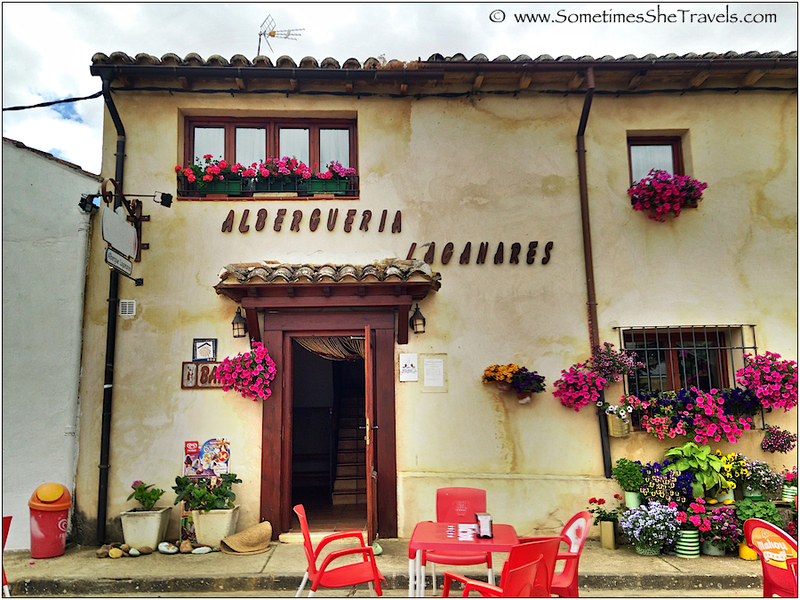 On Day 18, I stayed in Albergue Laganares in the one-horse town of San Nicolas del Real Camino. Visually it was charming. However, because it was the only “show” in town, the locals showed up at the bar around 9 at night and partied until late. It was actually rather surreal because they were so raucous. I actually found a book in English. Most of the books I saw along the Camino were in German or French. I spent the afternoon happily reading it. The yard at La Laguna. i couldn’t wait to stake a claim on one of the lawn chairs. Beautiful spot to relax after a long walk.